What Are the Common Indicators of Compromise? What Threat Intelligence Tools Are Available? Threat intelligence, or cyber threat intelligence, is information an organization uses to understand the threats that have, will, or are currently targeting the organization. This info is used to prepare, prevent, and identify cyber threats looking to take advantage of valuable resources. The great unknown; it can be exciting in many situations, but in a world where any number of cyber threats could bring an organization to its knees, it can be downright terrifying. Threat intelligence can help organizations gain valuable knowledge about these threats, build effective defense mechanisms and mitigate the risks that could damage their bottom line and reputation. After all, targeted threats require targeted defense, and cyber threat intelligence delivers the capability to defend more proactively. While the promise of cyber threat intel is alluring in itself, it is important to understand how it works so you can choose the right cyber threat tools and solutions to protect your business. Threat intelligence solutions gather raw data about emerging or existing threat actors and threats from a number of sources. This data is then analyzed and filtered to produce threat intel feeds and management reports that contain information that can be used by automated security control solutions. The primary purpose of this type of security is to keep organizations informed of the risks of advanced persistent threats, zero-day threats and exploits, and how to protect against them. Ensure you stay up to date with the often overwhelming volume of threats, including methods, vulnerabilities, targets and bad actors. Help you become more proactive about future cybersecurity threats. Keep leaders, stakeholders and users informed about the latest threats and repercussions they could have on the business. IP addresses, URLs and Domain names: An example would be malware targeting an internal host that is communicating with a known threat actor. Email addresses, email subject, links and attachments: An example would be a phishing attempt that relies on an unsuspecting user clicking on a link or attachment and initiating a malicious command. Registry keys, filenames and file hashes and DLLs: An example would be an attack from an external host that has already been flagged for nefarious behavior or that is already infected. As security vendors climb over each other to address the consumer demand for help with the growing number of threats, the market is now sprawling with threat intelligence tools. However, not all are created equal. For this level of security to work well, it must be doing its job every second of every day, scouring the vast and diverse expanse of online content for potential security threats. 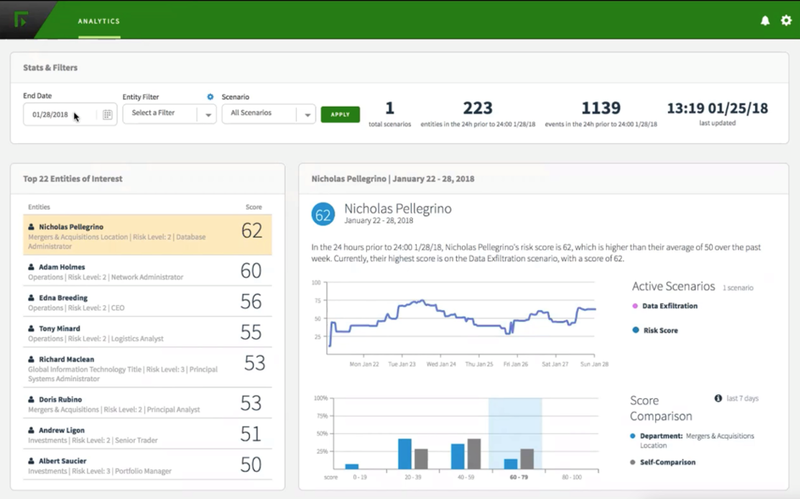 An industry leader in intelligent cybersecurity, Forcepoint's UEBA enables transparent comprehensive investigation with advanced analytics like machine learning and artificial intelligence that are tuned toward specific behavior risk.